Living in the southern hemisphere, the continent furthest from Korea, I’m constantly missing Korean food that I can’t find here, especially the food from street vendors. If you live in Korea or are visiting Korea for business or vacation, please enjoy the great goodies that you can easily find on any major shopping streets. Do it for me! So I bugged my husband to drive me to a Korean grocery store last weekend, which is about 1 hour away from where I live. I could drive, of course. But it is impossible to find parking space in that neighborhood, so he has to drop me off in front of the store, where I quickly grab a few things I need while he drives around the area until I finish shopping. The Korean stores are quite small and I can finish the shopping within 15 minutes. One great thing about Korean grocery stores in Buenos Aires is that you can usually get freshly made tofu and rice cakes along with fresh produce. I love plain rice cakes. I often eat them plain, right out of package without any additional flavor. Chewy and satisfying! It is a carb lover’s dream. But if I have to add something to make it even more delicious, here is one simple recipe that I would like to share. 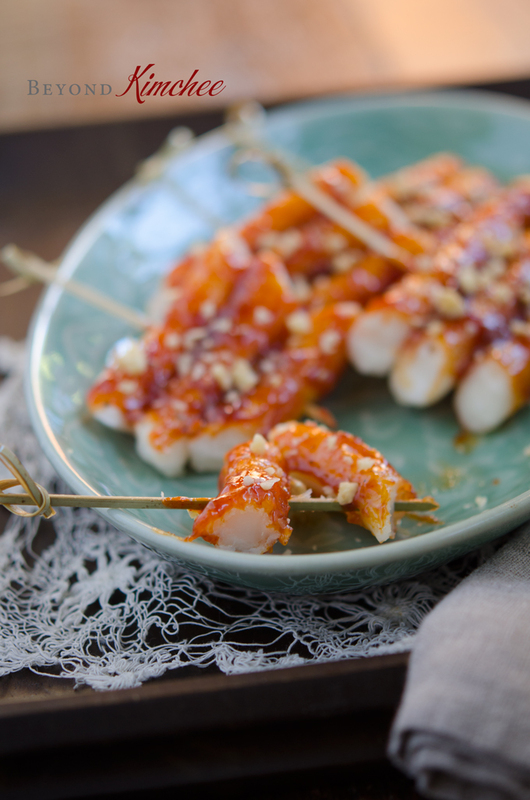 With this recipe, you can mimic one of the most famous Korean street foods. 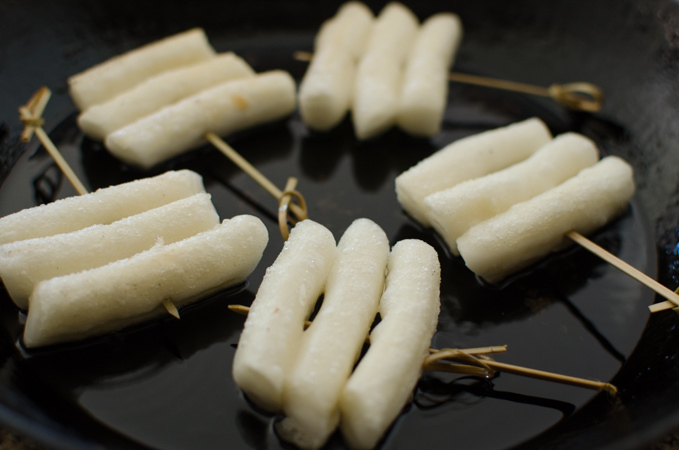 It’s the rice cake skewers called Tteok kkochi (떡꼬치). If you can access the freshly made rice cakes, you are very lucky. If you can’t find the fresh kind, but the frozen cakes are available, use them by all means. 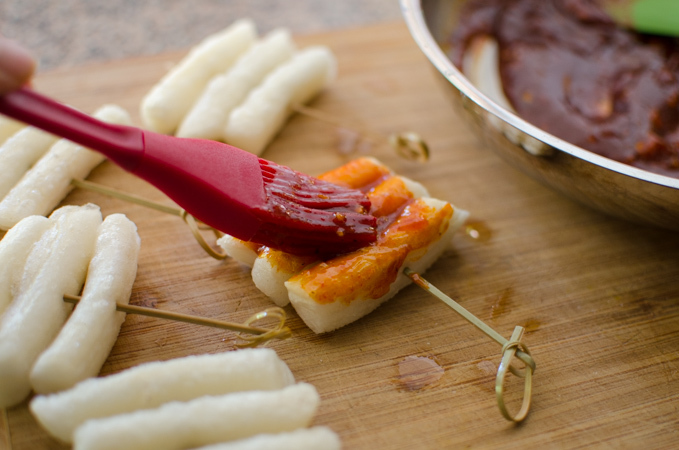 Now let’s see how easily you can imitate a delicious Korean street snack in your own kitchen. These are the main ingredients for the sauce. 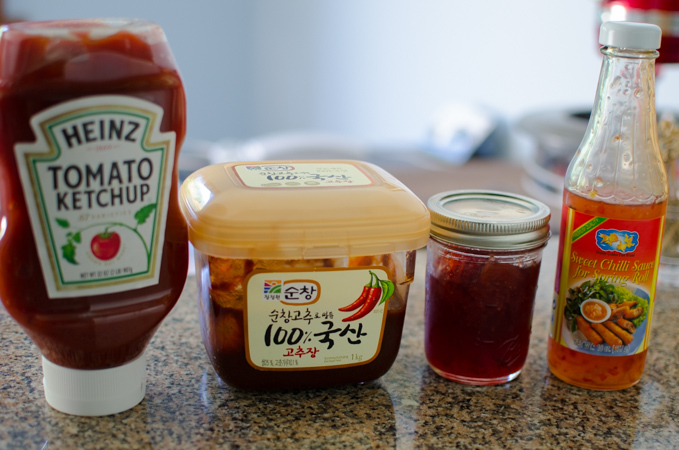 Ketchup, Korean chili paste, strawberry jam and/or sweet chili sauce. You can use either strawberry jam or sweet chili sauce, but if you happen to have both? Use them both. 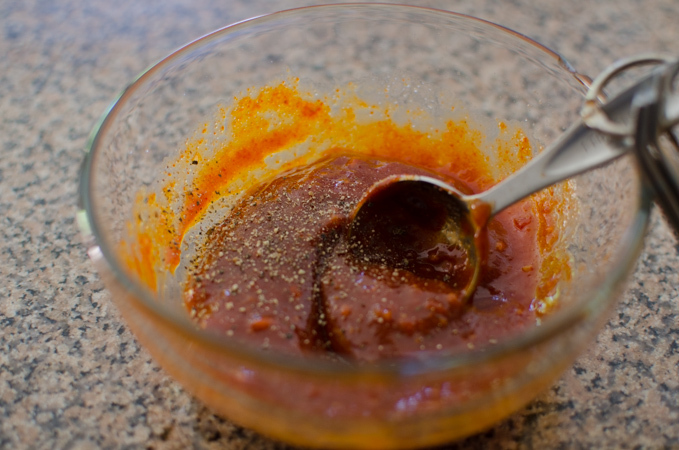 In a small mixing bowl, mix all the sauce ingredients together and set aside. Cut the rice cakes to the desired size. 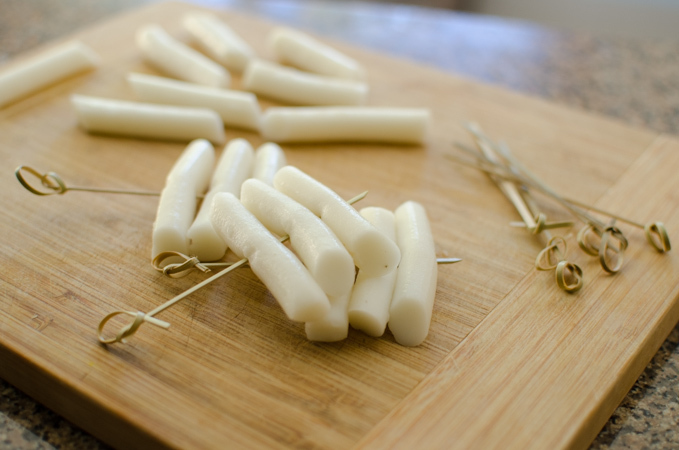 Pierce 3-4 rice cakes with skewers. Fry in the oil until the surface of the cakes gets bubbly and crisp, about 2-3 minutes on each side. In another small skillet, boil the sauce until it thickens a little. 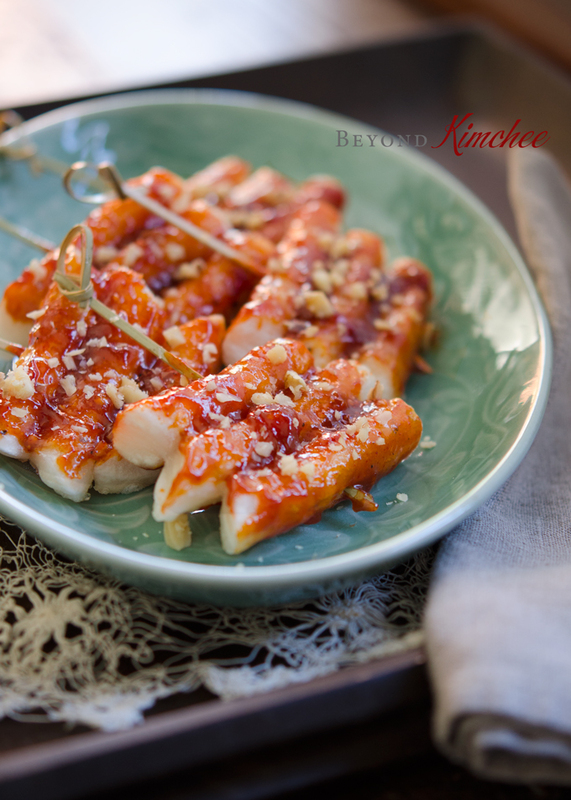 Coat the sauce over the rice cake and sprinkle with some chopped nuts of your choice. Walnuts, almonds or peanuts are great! Enjoy it! You will love the crisp texture on the outside but the chewy soft stickiness of rice cakes inside. Even my husband, who is not a big fan of anything “rice cake”, thought it was great. I must be getting older. I am feeling homesick these days.. I left Korea some 25 years ago, and never been able to live there since then. Although I occasionally visit and spend some time with my family, it is not the same. I envy those who get to live in Korea. Aren’t you having so much fun? Jealous…! 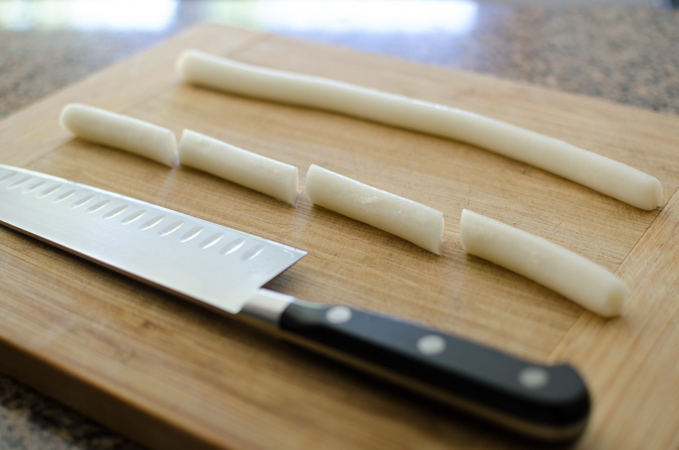 Insert the skewers through 3-4 fresh rice cakes. 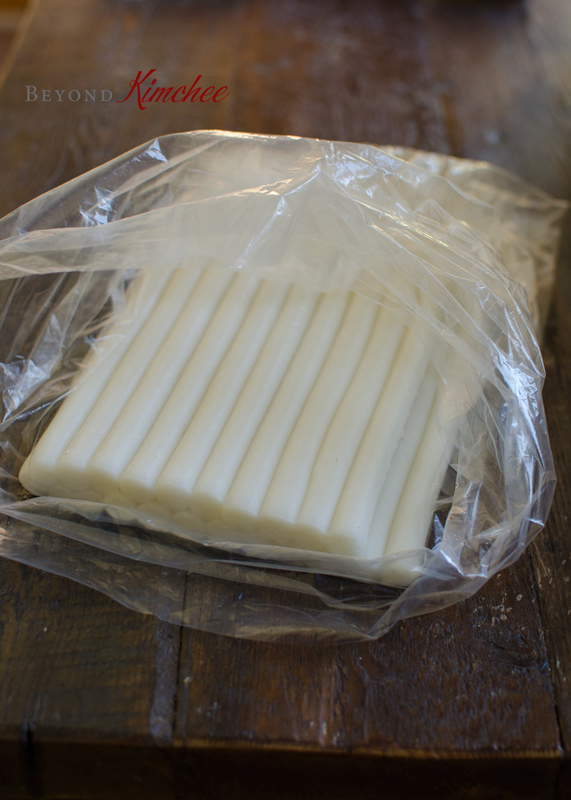 If using frozen rice cakes, blanch in hot water until soften, wipe off the water with paper towel, then insert the skewers. 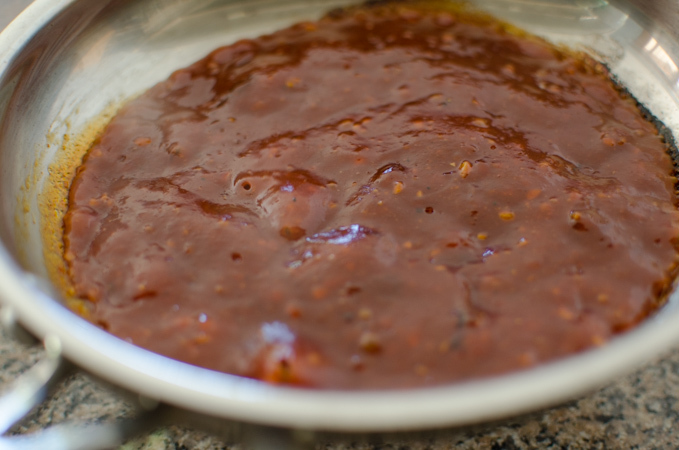 In a small bowl, combine chili paste, ketchup, garlic, jam (and/or sweet chili sauce), honey, water, and black pepper; mix well . Pour the sauce in a small skillet and boil for 1 minute until slightly thicken. Set aside. Heat oil in a skillet over medium heat and fry the rick cake skewers until crisp and bubbly on the surface, about 2-3 minutes on each side. Brush with the sauce and sprinkle the chopped nut over. That's great, Ri! Hope you enjoy the recipe. Thanks! I found your blog through Pinterest and it's SO awesome! I'm getting married this year and we'll both be away from our parents. It only leaves my fiance and me to figure out how to make Korean food on our own! We'll be living in a city where there's only one Korean supermarket. =( Thanks for all the wonderful recipes, keep them coming! (: On a coinkydink note, I was born in Sao Paulo! Hi Veronica, thanks for your comment. I am happy that you found my blog, too. Hope you enjoy cooking Korean foods with my recipes, and let me know if you have any questions. Do you speak Portuguese? I call this dukbokki on a stick. There is a Korean snack stand right by my old apartment and the Korean lady sold these for $1.00 a piece. Needless to say, I was there quite often. Thanks for the recipe! Oh, that is so sweet of you, Nami! I appreciate your offer ad I will keep in mind. Thanks! Yes! Thank you!! In my last visit to Korea, I starting getting addicted to 떡꼬치! I'm happy that I can make this at home. Also, I'm glad that your Korean recipes are in English, because I am an American-born Korean who doesn't have the best Korean :). 진심으로 감사합니다! Hope you can try this recipe soon. It is quite simple and easy to make at home. I miss all the great Korean street food as well. Hope my recipes can inspire you to make more Korean dishes. 감사합니다! Hi Dereck, thanks for the comment. I am happy to hear that you like my recipes and even cooking with them every day! That means a lot to me. You rice cakes look divine, just like the ones in many Korean restaurants. Great job! You live in Buenos Aires? Really? Today I went to China town in Belgrano to buy Gochujang and rice cakes. Is there a shop you like the most and you recommend to buy the ingredients? Do you offer cooking classes? Hello Holly! I LOVE your recipes! I made the tteo kkochi along with the soybean paste stew! So delicious! I love the crunchy outside and chewy inside! My picky oldest child loved it, too! I recently watched the drama, Late Night Restaurant. I loved watching all the food they made and ate at the restaurant in the show. The next recipe I'm going to try is the spareribs with old kimchi! I saw them eating that on the show and I wanted to eat it so badly. I was thankful you have the recipe on your blog. Thank you for the fun blogs and Yummy recipes! 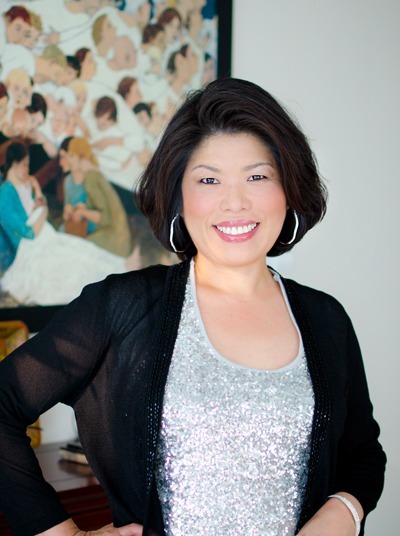 I am Holly, a native Korean mother and a wife whose favorite place in the house is the KITCHEN. 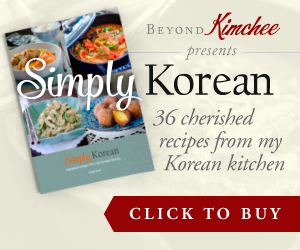 I hope you find lip-smackingly delicious Korean recipes and beyond in my site.